Attorney CL Mike Schmidt is responsible for the content of this website. Principal office: 3012 Fairmount Street, Dallas, Texas 75201. Clients not accepted in states where unauthorized by state bar rules. While a number of cases in our practice are handled by the lawyers at The Schmidt Firm, PLLC, some cases may be referred when warranted and in the best interest of a client. Our goal is to win a successful resolution to each and every case, however, case results depend on a variety of factors and prior results do not guarantee or predict a similar result in every case. No representation is made that the quality of the legal services to be performed is greater than the quality of legal services performed by other lawyers. The hiring of a lawyer is an important decision that should not be based solely upon advertisements. This website is not intended to be an advertisement or solicitation. Material contained in the The Schmidt Firm, PLLC website www.schmidtlaw.com is for general information only and does not constitute legal advice or solicitation of legal services. Transmission of information from this site is not intended to create, and its receipt does not constitute, an attorney-client relationship between The Schmidt Firm, PLLC and the reader or visitor. In the event that any information on this website does not fully conform to regulations in any jurisdiction, this law firm will not accept representation based on that information. In some jurisdictions this website may be considered advertising. We have made every effort to comply with all known legal and ethical requirements in providing this website. We do not desire to represent clients based upon their review of any portions of this website that do not comply with legal or ethical requirements in your jurisdiction. The Schmidt Firm, PLLC has created the following privacy statements to demonstrate our commitment to informed disclosure and to accurately communicate our use of your personally identifiable information. 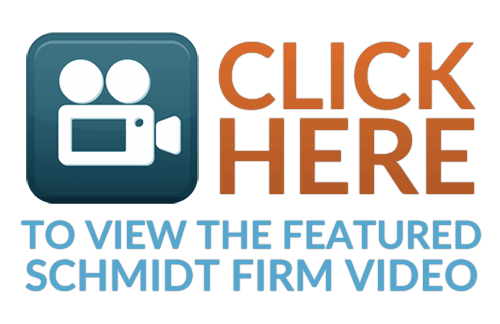 The Schmidt Firm, PLLC website uses online forms for visitors to request information from or a consultation with The Schmidt Firm, PLLC. When you fill out one of these online contact forms on the website, you may be asked to provide certain personal information including your name, address, e-mail, and phone number. After you fill out this form, your message is automatically forwarded to an attorney or legal assistant at The Schmidt Firm, PLLC, and your contact information is saved in a database. This information will be used only by The Schmidt Firm, PLLC and only to contact you in the manner of your specific request. Nothing contained in this website is intended to compare our services to the services of any other law firm or lawyer or to imply specialization or certification by any organization not previously approved by the Texas State Bar Board of Legal Specialization. Further, it should be noted that even where the fee arrangements are on a contingency basis, clients will still be responsible for payment or reimbursement of the costs and expenses. This website was created by The Schmidt Firm, PLLC. All elements of this website are copyrighted materials for The Schmidt Firm, PLLC. All rights reserved. Reproduction or distribution of any material from this website for commercial purposes is prohibited without the express written permission of The Schmidt Firm, PLLC. To obtain permission for the reproduction or distribution of material from this website for commercial purposes, please contact our legal counsel at (866) 920-0753.